At the risk of becoming the MacIver Institute’s resident food critic, I have seen the future of frozen yogurt. In the entranceway of Woodman’s grocery store in Waukesha, a kiosk robot is serving up the flavored icy treat complete with toppings. It’s not self-serve. You just insert your money or swipe your credit card, pick your flavor and your toppings, and the robot does the rest. Looks just like the arm on the space shuttle, only smaller, privately funded and less expensive. The good folks at Robofusion, the makers of “the world’s only retail robots,” installed the frozen yogurt machine at the end of May. According to them, these types of robots were previously only found at science museums. The Waukesha robot was the first of its kind at a traditional retail outlet. They are installing frozen yogurt robots around the world. The next time Al Gore is in Dubai he can stop for a tasty dish to cool his chakra. When we think of robots, we tend to think of menacing machines that kill humans in science fiction movies. Yul Brenner in Westworld didn’t offer Richard Benjamin chocolate sprinkles. But Brenner didn’t demand $15.00 an hour, either. Last week was yet another SEIU-driven fast food protest, ostensibly for a higher minimum wage. Congressman Gwen Moore was even “arrested” (but quickly released) at a McDonald’s on Miller Park Way. A study by the Heritage Foundation discovered the major fast food chains would have to raise prices 38% to cover the cost of increasing the minimum wage to $15. The price increase would drive away about one-third of the restaurant chains’ customers. The alternative is more automation and less workers. A study by the MacIver Institute showed that more than 7,000 people would be employed in Wisconsin if not for the three raises in the minimum wage since 2002. Another study showed that Wisconsin would lose 16,500 jobs if the minimum wage were raised to just $10.10 per hour. 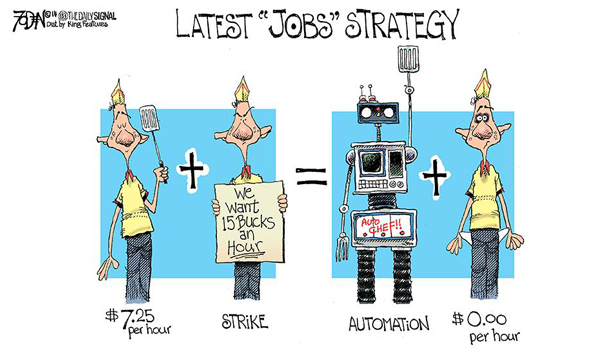 As labor costs go up, the cost of automation becomes less prohibitive. Robots are already used in manufacturing everything from cars to furniture. The profit margins at individual fast food restaurants may not make robots flipping and serving Big Macs economical now, but when confronted with a $15 per hour minimum wage fast food restaurants may not mind having a Hal 9000 asking if you want fries with that. We’re already seeing automation taking over many customer service jobs. We’re all familiar now with self-checkout at grocery stores. Now one person can assist eight customers or more at the same time as they attempt to pay for their grocery items. President Barack Obama was right when he observed that banks need less bank tellers thanks to ATMs. Now “branchless” banks are advertising on television. But don’t let all this automation stress you out. Go to Miller Park and literally help yourself to a beer. Miller Park has installed self-serve beer machines. Will robots serving bratwurst and nachos be far behind? Returning to our frozen yogurt desserts, the local shop has already reduced labor costs by allowing customers to self-serve. Just pour as much or as little of your favorite flavors and toppings into a bowl and put it on the scale. Instead of four or five people scooping to order to serve customers, all it takes is one or two people to take the money, keep the place clean and occasionally refill the machines. As we see at Woodman’s in Waukesha, pretty soon the local frozen yogurt place won’t even need a person to be the cashier. Robbie the Robot will be happy to take your credit card. The robot won’t be outside demonstrating for $15 an hour. He’ll be too busy adding the crushed Butterfinger topping and thanking you for your order.